Descendants 2 was slated to be the family tv movie event of the summer. It drew in over 21 million views after delayed views. The night we watched it, my Mom, my sister and I all sat on the couch. When we pressed play, we were expecting a movie to topple all other Disney movies. Instead, well, we were a little disappointed. The movie’s main characters were Mal, Evie, Jay, and Carlos. In the very beginning, you hear the song Ways to be Wicked. But, that turned out to be a day-dream. Most of the newly reformed villain kids find it easy to be in Auradon. Evie runs a thriving clothing design business, and Carlos and Jay are quickly rising to the top at sports. The only one who feels out of place is Mal. She finds it very hard to be the perfect Auradon girl everyone thinks she should be. So much so that she needs to use spells and magic to do so. When Ben finds out, he basically goes Beast mode on her, which determines her next move. Mal goes back to the Isle, where she feels she belongs. When Ben discovers this, he makes Evie, Jay, and Carlos take him to the Isle to bring back Mal. Enter Uma, daughter of Ursula. As you may remember from my review of Rise of the Isle of the Lost, Uma is very mad at Mal. She wanted to go to Auradon. Now, she will stop at nothing to get there. She captures Ben, and the newly reformed villain kids have to get him back before it’s too late. After that very long synopsis, it’s time to discuss. Basically, Descendants 2 was very jumpy. It jumped from one plot line to the next. Everyone seemed to be in a big hurry to get it over with. These people are in a hurry just like the characters in Descendants 2! Mal goes back to the Isle. Mal does not want to leave. But, after they get Ben, she all of a sudden goes back happy as ever. No time to explain why, it just happens! Another thing is the obvious plot holes. In her escape the Isle, Mal brings tiny little Maleficent dragon aka her mother (who is now in Mal’s room) with her in a small box. Nothing happens with her for the rest of the movie. I mean, if you are going to bring the dragon, something has to happen! It really just does! There were also some parts that didn’t need to be there. For example, Dude the dog starts talking after drinking a potion. Up until the end where that has a purpose (of winged dogs 🙂 ), he is pretty much comic relief. This I have to discuss. I will just name a few of the main ones and explain them. Ways to be Wicked: This song was definitely one of the best songs! It certainly had that same wicked feeling as Rotten to the Core. However, I wish that this was real and not a daydream. This song was a daydream, but I think the movie would have been so much better if they went with this plot line! What’s My Name: This one was the most catchy song. It’s very good…For about the first 2 minutes. The next 52 seconds are extremely long and probably not necessary. This song also did not have the best dance moves. It’s Goin’ Down: Oh Disney, Disney, Disney. A rap battle?! Really?! This is just ridiculous! They are speaking to music and honestly, the lines get really silly after a while. There is definitely another way to approach this moment. A rap battle just isn’t it. I Give This Movie 2.5 out of 5 Pencils! Thank you for reading my first movie review! 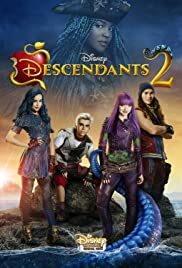 Did you watch Descendants 2? Next Meet Nibbles, My Pet Guinea Pig! Another great Descendants post, Rose! It sux that the movie isn’t like 💥 (especially cuz we’ve all been waiting for it for, like, forever) but thanks for the review! Oh–my baby sister was looking over my shoulder as I was reading this, and she absolutely LOVED the GIFs!